While seniors may be known as being notoriously late to adopting the latest technology, over the past few years, older adults have started catching up with their younger counterparts. For instance, a study from the Pew Research Center revealed that compared to the year 2000, when 86 percent of adults age 65 and older never used the internet, that figure today has been cut in half. Seventy-seven percent of these seniors also report that they have cell phones, and 47 percent have a high-speed broadband internet connection at home. The internet itself has been an important element in reducing feelings of isolation and loneliness that can often lead to depression in seniors. While technology can’t replace in-person interaction, going online regularly provides a way to stay in touch with family and friends who may not live nearby. Technology can not only improve mental health, but physical health, too. Video games played on a system like Nintendo’s Wii help keep the mind and body active, plus offer some much-needed social interaction when enjoyed in a group setting. Plus, wearable fitness trackers help monitor activity levels, keeping seniors healthy by encouraging nutritious eating and regular exercise. The Pew study also revealed that although more seniors are utilizing technology than ever before, many still feel slightly hesitant when it comes to learning how to properly use their new devices. In fact, almost 80% of these older adults think they would need someone to help walk them through the process. However, once they’re comfortable using these laptops, tablets, smartphones, and more, the technology becomes an important part of their daily lives. Keeping in touch with loved ones. 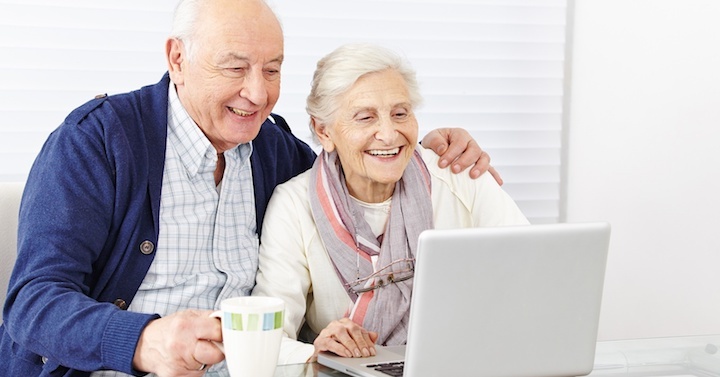 Email, Skype and social media allows seniors to connect with loved ones no matter their geographical locations. The number of older adults going online to visit websites like Facebook has increased in the past few years, rising from 43 percent to 56 percent from 2013 to 2014. Joining online community groups. Online community groups offer a perfect way to connect with others who share their interests, or who even share similar health conditions. Seniors can discuss their personal experiences, challenges or thoughts on everything from their favorite books and television shows, crafts and hobbies, or health-related issues. Seeking the latest news and events. While many seniors still seek news and information in the traditional manner – through the newspaper or nightly TV news – more older adults are turning to the internet to get daily news. Online news tends to be more timely, offering immediate coverage about events going on in the world. Improving brain health. Technology for seniors also provides a great way to improve cognition and memory through online “brain games.” The AARP’s website offers a variety of fun games that can be played with others online, allowing for some friendly competition and social interaction. Providing safety in the event of an emergency. Wireless systems like monitoring devices, surveillance cameras, door and window alarms all help provide peace of mind for older adults should an emergency situation arise. For instance, if a senior suffers a fall, he or she can simply push a button on a monitoring device to get help immediately. At Immanuel Lutheran Communities, residents live life on their own terms, enjoying everything they need for socializing, learning and growing. As Kalispell’s only life plan community, we offer independent living, assisted living, skilled nursing services, rehabilitation and post-acute care in a beautiful, comfortable setting. Contact us today to schedule a personal tour.